Southern California hadn’t had significant rainfall since May of 2017, when we received just under an inch. Then yesterday, a strong sub-tropical storm sent both wind and rain our way – bringing much-needed moisture to our parched region. My husband and I removed our grass and other thirsty plants from our landscaping and installed drought-tolerant succulents years ago. But, even though these elegantly architectural plants can survive on little water, they also welcome the rain; catching and displaying the droplets on their broad, fleshy leaves. I am grateful for the end of a long dry spell, and I hope for more rainy days before too long. California’s drought has lasted over five years. Many of us have learned to take shorter showers, capture running tap water while it is being heated so it isn’t wasted down the drain, and not be so fussy about… um… flushing. Some of us have changed out our landscaping to reflect the desert climate we live in and others have installed water barrels to better manage the rain they get. What at first may have seemed a hassle is now just second nature to most of us. It’s the right thing to do. In the summer of 2015, we started to read about the warming waters of the Pacific Ocean and how the resulting El Niño weather phenomenon would give Southern California the best chance for above-average rains. I even wrote a post about being grateful that we had a roof over our heads because of the anticipated storms. At the same time, Northern California was predicted to get much less precipitation. In fact, just the opposite happened. Last season, Northern California did much better both in the rain they received and the snow levels they experienced. On the other hand, except for a few days of torrential downpours, Southern California’s El Niño was mostly El Disappoint-o. Well, that didn’t happen either. Although the prediction was correct regarding the above average rain in Northern California, Southern California has been experiencing a wetter than normal rainy season this year too. In fact, we are now well above average in our seasonal rainfall totals. Even though we hear a few grumbles (including that we don’t know how to drive in the rain – which is true), most of us are willing to put up with any inconvenience for the sake of the overall health of our water supplies. There has been some discussion about whether or not California’s drought is over. Some say “Yes,” and advocate for the removal of water conservation restrictions. Others argue “No,” and caution against prematurely declaring that all is well. I certainly don’t know the answer, but given our desert climate and how weather patterns have become less-and-less predictable worldwide, I’m willing to take the pragmatic approach and do what I can to help preserve this precious resource into the future. In the meantime, I am so grateful for the rain we have received so far this season and, hopefully, will continue to enjoy over the next few months. The strong El Niño we were warned about is finally here. Although it is sunny today, last week the skies over Southern California opened up and began to pour rain. And, they say it is only just the beginning. After the long drought we’ve had, most of us are extremely grateful for the precipitation. I know we’d prefer gentler showers, but, unfortunately, we don’t get to choose. The last time this area was hit by a record El Niño was the winter of 1997-1998. That was the winter that we didn’t have a roof. We had purchased our house three years earlier with the intention of remodeling. The house had a great view but its small dark rooms, pink kitchen with pink appliances, and single bathroom (with pink tile!) were indicative of its 1950s pedigree. We wanted to open it up, enlarge some rooms, and add a second floor master suite. Because we were living in the home during construction and doing much of the work ourselves, the project took a bit longer than we initially anticipated… two years longer, to be exact. 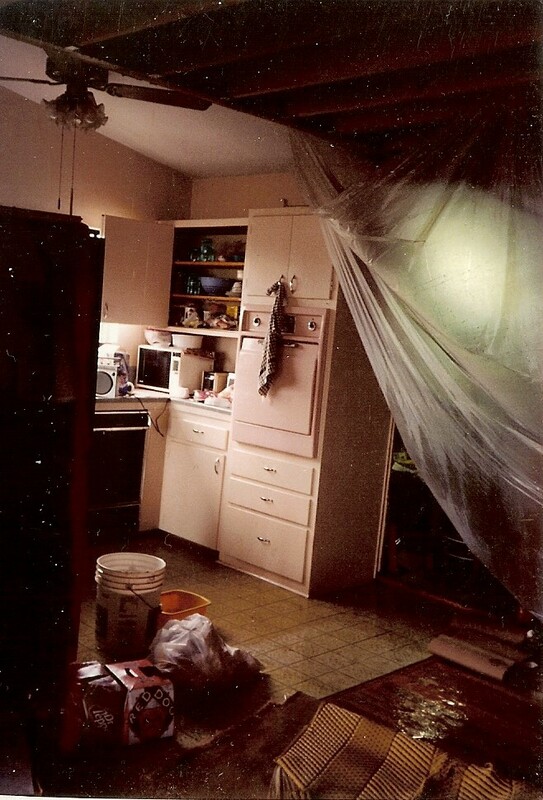 When the El Niño storms hit Southern California late in 1997, the house was in the midst of demolition and construction. Our second story was framed out but there were no roofing materials over the rafters. When it started to storm, water poured down through every opening—and there were a lot of them—into the first floor below, soaking the original hardwood floors we were trying to protect. 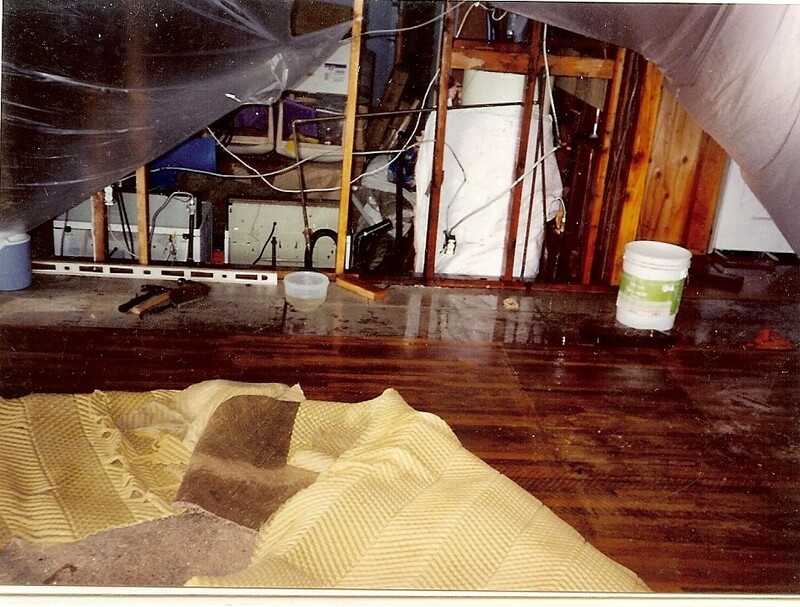 We tried to channel the water as best we could away from the floors and other vulnerable areas. 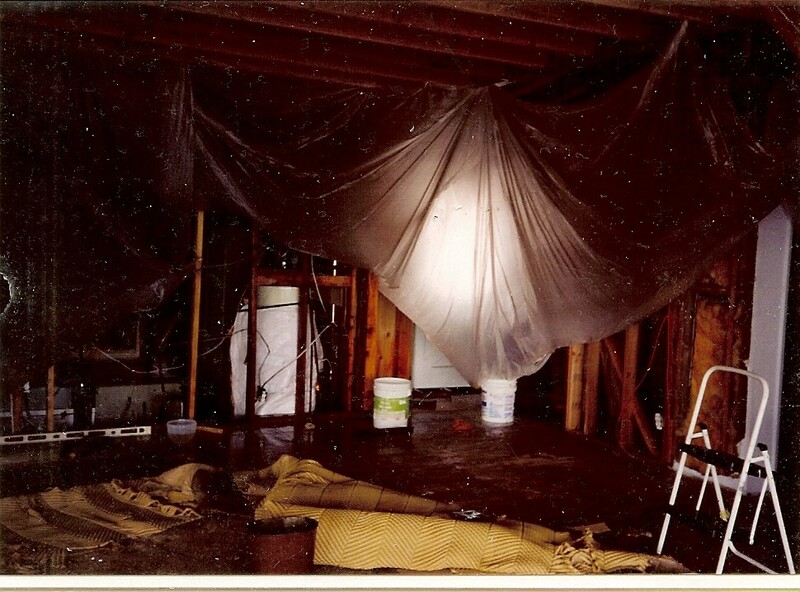 We stapled plastic tarps to the ceiling joists, hoping to divert the water into the trashcans and buckets we had positioned around our house. One day I stayed home from work to try and manage the situation, but, at one point, I had to give up. The rain was coming down in torrents, the wind was howling, and our tarps were rendered useless. After shedding some tears in frustration, I picked up my camera to document the mess. Then, after several months of what seemed to be constant rain pounding our area, El Niño was finally over. We slowly dried out and proceeded with our remodel. Although it impacted our project, what happened to us pales in comparison to what others experienced. Roads were washed out, crops destroyed, businesses flooded, homes devastated by mudslides, and people lost their lives. One report indicated that El Niño’s global impact caused upwards of $45 billion in economic losses and claimed an estimated 23,000 lives. Now, almost twenty years later, another El Niño is here and some say this one could be even stronger than 1997-1998. Fortunately, this time our house is buttoned up tight and we can observe the rain from the inside out – not from the outside in. I am so grateful that we are ready for it this time. I hope others are too.